Thanks to Cliff Bellamy at the Herald Sun for reviewing The Ballad of Fred Hersch for the Full Frame Documentary Film Festival. Love the title! Poster done! Ready for Full Frame. Our poster beautifully designed by Berlin artist Emily Smith is out. We are ready for the Premiere at Full Frame. We are thrilled to announce that The Ballad of Fred Hersch will premiere at the prestigious Full Frame Film Festival on Saturday, April 9th. Finishing up the sound mix with Jim LeBrecht at Berkeley Sound Artists. A treat to work with the Maestro. 431 shots, picture locked, we have started color correction for The Ballad of Fred Hersch with Robert Arnold. The Ballad of Fred Hersch is officially an international production with editor Warwick Meade in New Zealand, Carrie Lozano in Berkeley and Charlotte Lagarde in Brooklyn. Grateful for all the new technologies that make it possible. We are thrilled to announce that The Reva and David Logan Foundation have granted a $100,000 matching fund for The Ballad of Fred Hersch. 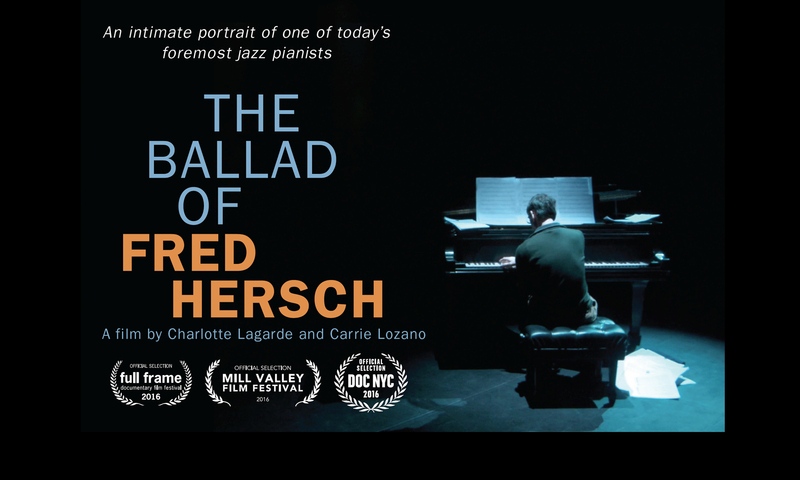 Please help us match the fund by making a tax deductible donation so we can finish this intimate, moving and important film about Fred Hersch. "Mr. Hersch, with his fluent exposition, his rapturous clarity and his elegant assurance of touch, leads the way." says the New York Times. We couldn't agree more. Continue reading "“That Fred Hersch used music to tell about being close to death struck me as such a breakthrough,” said Dr. Rita Charon"